A center console is installed on a Chrysler 200 in 2014. FCA said last week that it would lay off 1,300 workers over weak demand for the 200, production of which may be outsourced. 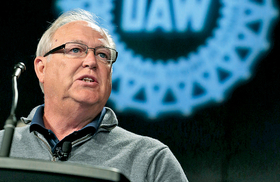 The UAW's president called Ford Motor Co.'s plan to make small cars in Mexico instead of the U.S. "very troubling." Donald Trump labeled it "an absolute disgrace." But executives say it's the reality of the shrinking market for low-margin cars, even if it puts Ford in the crosshairs of a presidential election in which globalization and its effect on working-class American jobs has become a central issue. Weak car sales also compelled Fiat Chrysler Automobiles to announce 1,300 job cuts in Michigan last week. Ford plans to start building a $1.6 billion plant in Mexico this summer, without waiting to see if Trump gets a chance to follow through on threats to tax vehicles crossing the border. "We're a proud American company," Joe Hinrichs, Ford's president of the Americas, told Automotive News. "We set up our global manufacturing footprint and our facilities where we think it makes the most sense for our business." Ford said the plant, scheduled to open in 2018 and create 2,800 direct jobs by 2020, is necessary to make its small cars more profitable and that no jobs will be cut in the U.S. as a result. It plans to halt U.S. production of its Focus and C-Max compacts in 2018, dedicating its Michigan Assembly Plant to lucrative pickups and SUVs instead, sources have said. That means the 3,700 people who work there should have better job security building the bigger, costlier vehicles consumers can't get enough of than continuing to make slow-selling compacts, many of which now end up in rental fleets. But UAW President Dennis Williams -- who has known of Ford's plan for nearly a year but didn't block it during last fall's contract talks -- still blasted Ford for shifting production south of the border and criticized the trade agreements that allow it. "For every investment in Mexico it means jobs that could have and should have been available right here in the USA," Williams said in a statement. "Companies continue to run to low-wage countries and import back into the United States. This is a broken system that needs to be fixed." Williams: Jobs should have been in U.S.
Also last week, FCA announced it would lay off 1,300 workers over feeble demand for the Chrysler 200 sedan. Production of that car ultimately may be outsourced to Mexico or another country, with trucks or SUVs replacing it at the Sterling Heights Assembly Plant -- which another UAW leader framed as good news for workers there. "FCA is not the only company experiencing a slow market for small cars. On a bright note, there is a strong demand for larger-sized vehicles," Norwood Jewell, the vice president in charge of FCA negotiations, said in a statement. "I believe that in the long term this move will be a positive one for our members and the company." The UAW paved the way for Ford and FCA to build cars in lower-wage countries last fall, when it signed deals that largely eliminate the two-tier wage structure its members despised. Ford told the UAW it also planned to consolidate production of its Fusion sedan in Mexico and stop making them in Michigan, which it did in March. Ford officials have tried to blunt the criticism by pointing out that more than 80 percent of its capital spending and 97 percent of engineering work occurs in the U.S. The company has added 25,000 jobs and invested more than $10 billion in the U.S. since 2011, with at least $9 billion more committed by 2019. Ford is not the only automaker adding production in Mexico. Kia, BMW and Audi are among the brands building plants there. But only Ford has been targeted by Trump, who has repeatedly listed the automaker alongside Carrier, Nabisco and other companies moving jobs out of the U.S.
"These ridiculous, job-crushing transactions will not happen when I am president," Trump said in a statement responding to Ford's Mexico announcement last week. The constant attacks have forced Ford CEO Mark Fields to respond more directly as Trump has drawn closer to winning the nomination. "At the end of the day, we're a global, multinational company, and we will invest to keep us competitive," Fields told reporters March 23 at the New York auto show. Ford hasn't opened a new North American assembly plant since 2004, when it spent $2 billion to create a showpiece in the aging Rouge industrial complex a few miles from its headquarters. Since the Dearborn Truck Plant started churning out F-150s in May 2004, Ford has closed eight assembly plants in the U.S. and Canada to fix its bloated factory operations. That backdrop, along with record pretax profits for the company last year, has fueled the UAW's outrage as Ford now looks 2,000 miles south of Dearborn for its first major expansion since the recession. "Ford is simply making a long-term play that, given where the market is today, it's important to align their manufacturing footprint in the U.S. with higher profit-margin offerings," said Mike Jackson, senior manager of North America vehicle production forecasting at IHS Automotive. "Clearly the margin potential of a Focus is significantly lower, not even a small amount. To this end, Ford is being responsible by saying, "We want to make sure that we're competitive in that category.'" Ford Motor Co.'s last new North American assembly plant opened in 2004 in Dearborn, Michigan, after a $2 billion renovation in the Rouge complex. Since it's opening in February 2004, eight North American plants have shuttered, six of them in the United States. This map shows changes in Ford's North American manufacturing landscape. Blue markers are active plants, red markers are closed plants. Select specific years to see what plants closed that year, or select every year for a complete look at the changes that have occurred since the Dearborn plant opened.